After the sustained recovery phase which marked the latter part of 2017, the current year began with a partial deceleration of economic activity. According to the estimates of the short-term PBO model reported in the Note on the economic situation in April, the increase in GDP in the first quarter of 2018 was 0.26 per cent (compared to 0.32 per cent in the last quarter of 2017) and slowed down marginally in the second quarter, reaching 0.21 per cent. On the whole, GDP growth in the first half of this year reached 0.5 per cent, down compared to the second half of 2017, when the increase over the previous six months was 0.8 per cent. Simple pause or alarm bell? The reduction in production in the early months of the year are shared by Italy and the major countries of the euro area, these too affected by signs of a partial slowdown. However, at international level, the overall medium-term outlook appears to be positive, as shown by recent IMF forecasts. After the very favourable performance in the second half of 2017, Italian exports recorded a slowdown at the beginning of 2018 both in terms of value and volume. Domestic demand remained fairly brisk, in particular investment spending driven by stable positive growth prospects. The signs of a slowdown, confirmed also by the recent data on turnover and orders, do not seem, at least for the moment, to be the symptom of a more marked trend reversal. According to PBO estimates, industrial production in the first quarter should nevertheless increase compared to the October-December average, thanks to a rebound in the index expected for March. Moreover, despite the setback in production, at the beginning of 2018, the various manufacturing sectors were still undergoing a fairly good expansion phase. The new diffusion indicator developed by the PBO (fig. 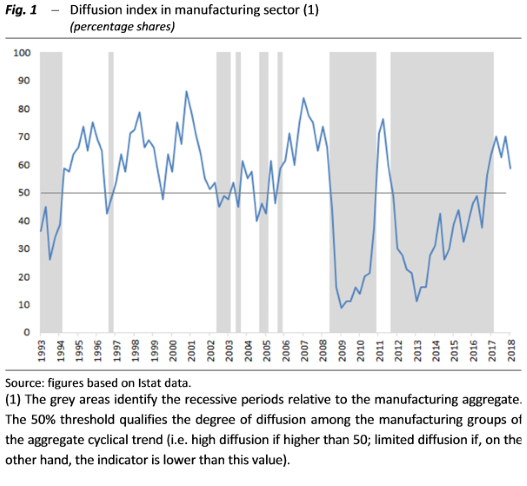 1) shows a high degree of extension of the recovery; even taking into account the downward correction induced by the latest less favourable data, the PBO diffusion index is well above the 50 per cent threshold and shows a positive cyclical condition for most sectors. 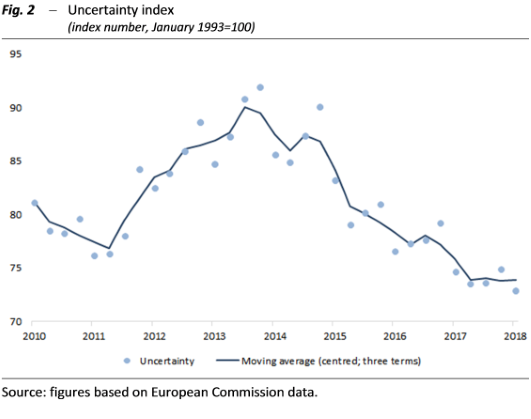 Uncertainty remains at low levels among families and companies – As can be deduced from the various qualitative indicators, the basic feeling relating to the economic trend remains moderately positive, since it does not seem, at the moment, particularly influenced by the uncertainty of the political situation which emerged from the elections of 4 March and by the evolution of the international scenario. Looking ahead, however, risk factors still exist associated with geo-political tensions, the protectionist tendencies triggered by the tariff measures of the United States and the accentuation of financial instability, which could increase uncertainty and risk aversion on the part of operators, with negative effects on Italian growth. In the production sectors as a whole, the aggregate index of business confidence, obtained as a weighted average of the sector’s climates, was relatively high at the end of the first quarter of the year compared to the long-term average, although slightly lower than at the end of 2017. The level of economic uncertainty that can be inferred from the surveys conducted on businesses and households (PBO uncertainty index) remains at the same low levels that marked the previous year, favouring the continuation of the economic activity recovery phase (fig.2). Finally, there were positive signs, albeit less than in previous months, from the summary indices of the economic cycle prepared by various institutions (the Bank of Italy’s ITA-coin coincident indicator and the ISTAT anticipatory indicator). Labour market: slow pace, but signs of recovery for permanent employment – In the early months of 2018, the employment trend slowed down even further compared to the last quarter of last year, when the stability of employment figures was bolstered by the positive performance of the temporary component, which offset the decline in permanent jobs. In early 2018, however, there were signs of a recovery in permanent employment. INPS data currently available for 2018, relating to the January-February period, indicate a recovery in the transformation of fixed-term positions into permanent jobs (+83,000, +79.5 per cent compared to the same period of 2017). Permanent jobs also increased (8.4 per cent, +18,000 positions compared to January-February 2017), alongside the positive trend that continued to characterise temporary components. However, the gradual improvement on the employment front has been accompanied by a still slow absorption of the large pool of under-utilised labour. Taking into account, in addition to unemployment and the potential labour forces (consisting of the inactive population closest to the labour market), also the share of underemployed population, the degree of under-use of the labour forces, although decreasing, was still very high at the end of 2017: about 23 per cent in the fourth quarter, i.e. 13 percentage points more than the official unemployed figure in the same period (fig. 3). This trend shows an improvement compared to the situation in early 2015, when the under-utilisation rate reached a peak of 25 per cent, a difference of almost 15 points from the percentage of unemployed, but which still indicates a condition substantially far from that which characterised the Italian labour market in the pre-crisis period (in 2007, the under-utilisation rate was around 17 per cent, about 10 points higher than the percentage of unemployed).